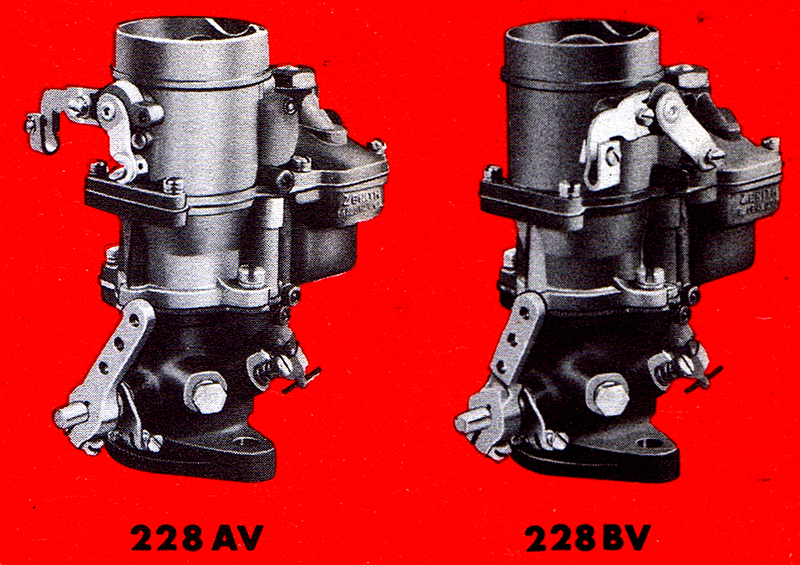 The Zenith Model 28 / 228 is a single barrel downdraft carburetor that has been in production since 1936. It has been used as original equipment on many makes, starting with the 1936 GMC. It is most commonly found on industrial and heavy duty truck applications and is still being produced today for industrial engines. Many were sold as service replacement carburetors. 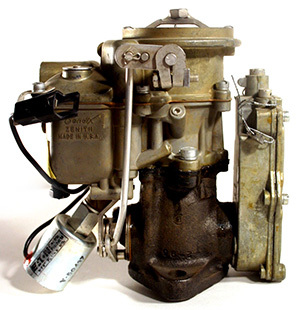 These carburetors consist of three parts, the throttle body, float bowl and airhorn. The throttle body (#57)is made of cast iron and is finished in black oxide. The throttle shaft (#63) is brass or steel with a 5/16" diameter. 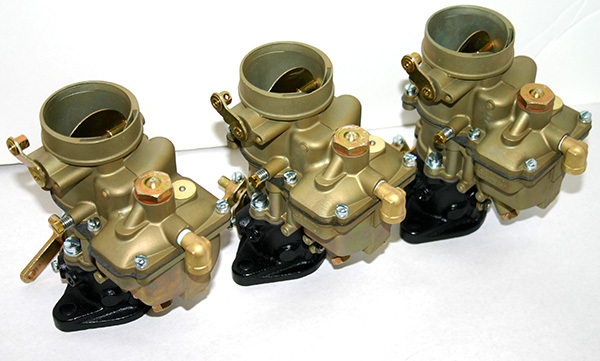 Worn throttle bodies can be repaired by installing 3/8" OD bronze bushings. Throttle bores were either 1-1/4" or 1-1/2". The smaller bore is intended for engines of less than 300 CID. 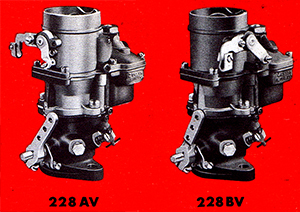 In Model 228 carburetors, the idle mixture screw (#20) is located in the throttle body; it controls the fuel mixture at idle - turning it inward leans the mixture. Model 28 carbs have the idle mixture screw a the top of the float bowl, but otherwise function the same way. Between the throttle body and float bowl is a removable venturi insert (#50), made of cast zinc. There are several sizes of these to accommodate different applications. The float bowl (#46) is cast zinc and is finished in olive-green chromate. Some models have an adjustable main jet (#53); turning the screw in leans the mixture when running above idle and under load. A power valve (#35) in the allows for a richer mixture under load; this is operated by the power valve actuator in (#24) the float bowl cover. Our kits CK921, CK923, CK943 and CK944 contain many of the hard parts in the carburetor, including the power valve actuator. 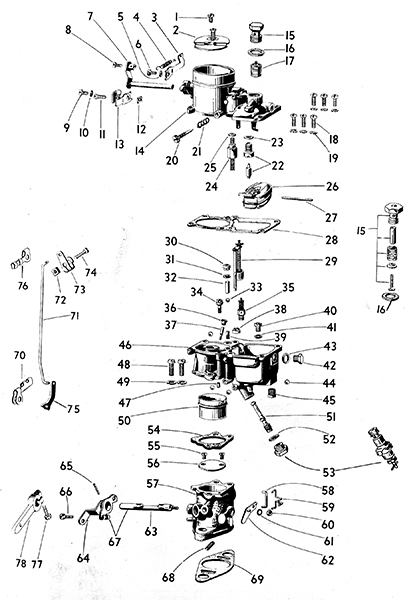 More information on the operation of the carburetor circuits is in the service manual CM514. Some carburetors (for stationary applications) did not use an accelerator pump (#29). Where used, most pumps were made of steel, instead of the more common rubber plunger type. These pumps don't wear. They form a hydraulic seal as the pump moves in the bore and are generally trouble free. One of the more difficult parts of restoring these carburetors is the removal of the pump discharge check valve (#38), found in the bottom of the accelerator pump bore. This can be removed by screwing a wood screw into the brass check valve and pulling out with a slide hammer. Re-installation should be done with a suitable sized drift so that the valve can be installed square and without damage. The airhorn (#14) is also made of cast zinc with a chromate finish. The float (#26) is suspended from the underside of the airhorn. The float is made of brass and is available new. Brass pumps can be repaired by re-soldering; leaks are usually at the seams. Many of these carburetors have a filter element (#17) made of thin plates under a large plug in the top of the float bowl. This element can be cleaned and re-used. Scale and corrosion can be removed using a phosphoric acid type metal cleaner. Manifold mounting: Parallel or crossed (see illustration). Crossed style has the choke shaft at right angle to the throttle shaft. Governor: Some models have an integral Zenith governor. Other applications have a governor between the carburetor and intake manifold. Zenith carburetors are identified by the numbers on a round, riveted aluminum or brass tag on the top of the float bowl. There are one or two concentric numbers. If there are two numbers, the outer one is the manufacturer's number. The inner one is the Zenith carburetor number and can be used to find the kit and other parts in our numerical index. Set of three marine Zenith Model 28s. Note brass tag near fuel filter plug. Late model carburetor with integral governor and fuel shut-off solenoid.